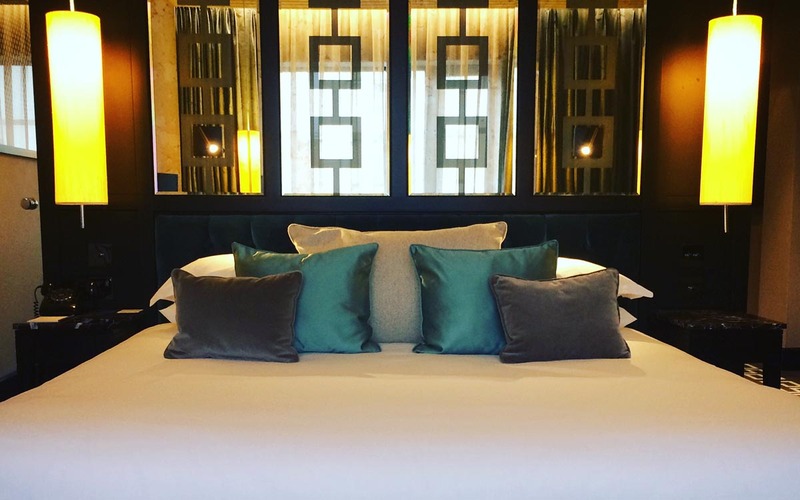 We were really looking forward to our stay as it was our first time staying in the Fitzwilliam and it ticked another Belfast hotel off our must stay list! And well, who doesn’t like winning something!? 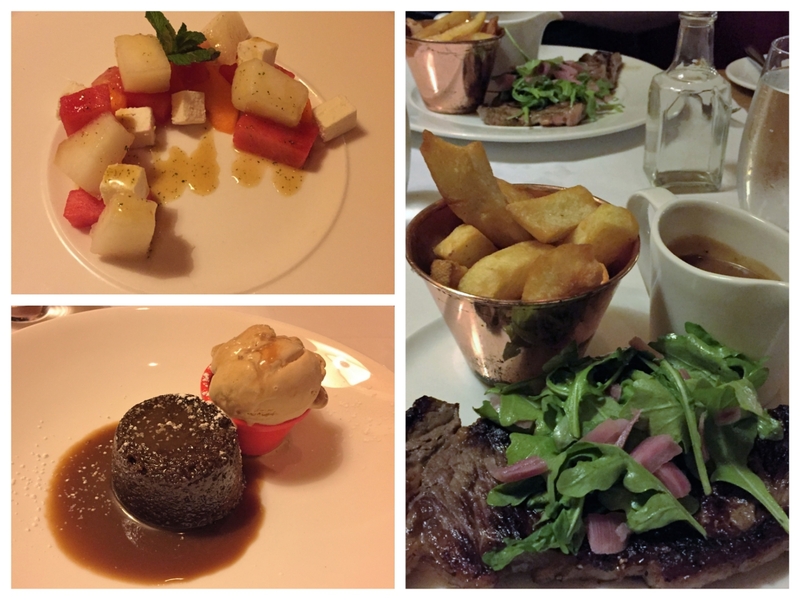 It was a fabulous evening and we made the most of it by indulging in the pre-theatre menu in the Fitzwilliam restaurant. It was a Friday and Nial was at work so I arrived at the Fitzwilliam before him allowing me to get settled in and check the hotel out. Well, it only made sense to not waste the opportunity of relaxing in the beautiful surroundings! I walked into the stunning lobby of the boutique hotel and I checked in at reception where a pair of theatre tickets were waiting for me. The lobby is so sophisticated and has a real air of Hollywood glamour. It completely sets the mood for the rest of the hotel. Once I had the room card I couldn’t wait to go check it out! The room did not disappoint in any way with its elegant design, sumptuous textiles and King-size bed. 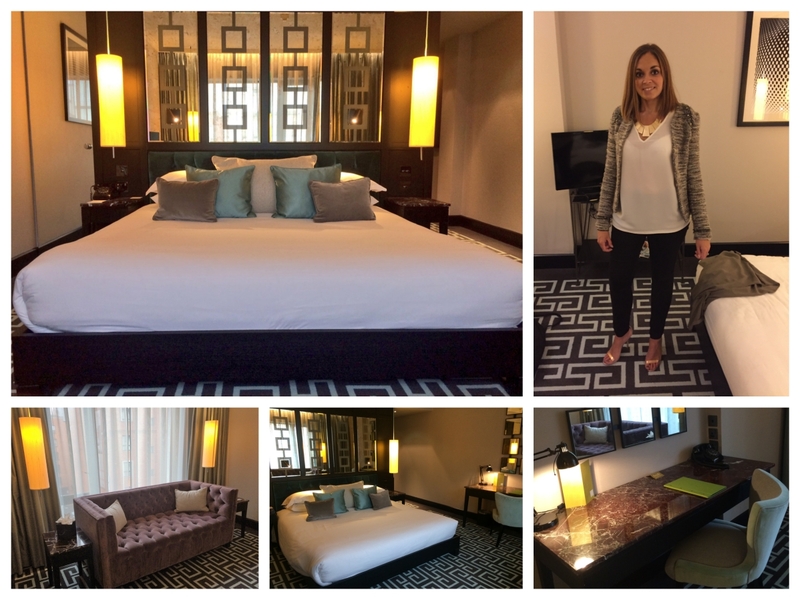 We stayed in an executive room and it had the instant effect of making you feel glamorous yourself! It was beautiful, from the sofa to the bedding, to the dark sultry colours, the room screamed luxury from the moment I set foot in the door. The monochrome en suite was just as elegant with the deep soak tub and large shower with sunflower head. The glamorous feel to the room allowed for a very relaxing environment and was the perfect start to an evening of dinner and theatre. As I had a couple of hours before Nial would arrive I decided to relax in the beautiful lobby with a coffee and a magazine, before heading back up to the room to relax some more. 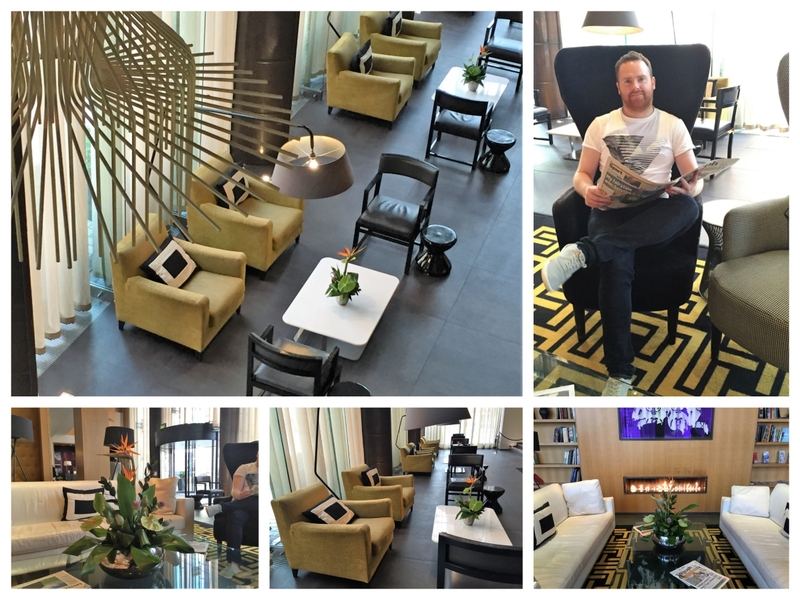 Nial arrived at the hotel shortly after work and was equally impressed with the sumptuous decor and quality finish. We both got ready for dinner and the musical and we headed down to the Fitzwilliam restaurant for a delicious pre-theatre meal before going to watch Chicago. We had made a reservation for dinner in advance to ensure we would get a table and give ourselves plenty of time to eat and relax before the show. We were glad we did as the restaurant was busy with hotel guests and other diners for the evening – always a good sign! To start with I had the sous vide compressed melon and feta with apple mint dressing, while Nial passed on a starter to save room for a dessert. I loved the starter, it was really fresh and zingy, and as many of you will already know my pregnancy craving has been fruit, fruit and more fruit, so the bump was happy too! For the main, we both indulged in a dry aged sirloin with pepper cream, rocket, pickled shallots and hand cut chips. This was a really tasty main course and the perfect portion size as we didn’t feel too full despite us both having clean plates. Nial had the sticky toffee pudding with Muscovado sauce and salted caramel ice cream for dessert while I passed on dessert, although I did ask for an extra spoon so I could sample Nial’s. The food was great and just what we needed to set us up for an evening of musical melodies. We were finished our meal in good time to allow us to relax a short while before heading to the Grand Opera House. After dinner, we headed down to the lobby. When we got to the doors we realised that it was raining very heavily, but it didn’t matter, we literally had only a few steps to walk before we were safely inside again! Another perk of being able to stay in a hotel right next door. When we entered the Grand Opera House we got our tickets stamped, picked up a Chicago booklet and a bought couple of refreshments before heading into the amazing theatre itself which is adorned with beautiful red velvet upholstery, gilded architectural ornaments and stunning painted murals. The Grand Opera House is a listed building and has been the venue of choice for audiences since 1895. It is such a beautiful theatre, it’s definitely worth entering in plenty of time to take it all in before the lights go down and the show starts. So it was time for the curtain to rise and the show to commence! 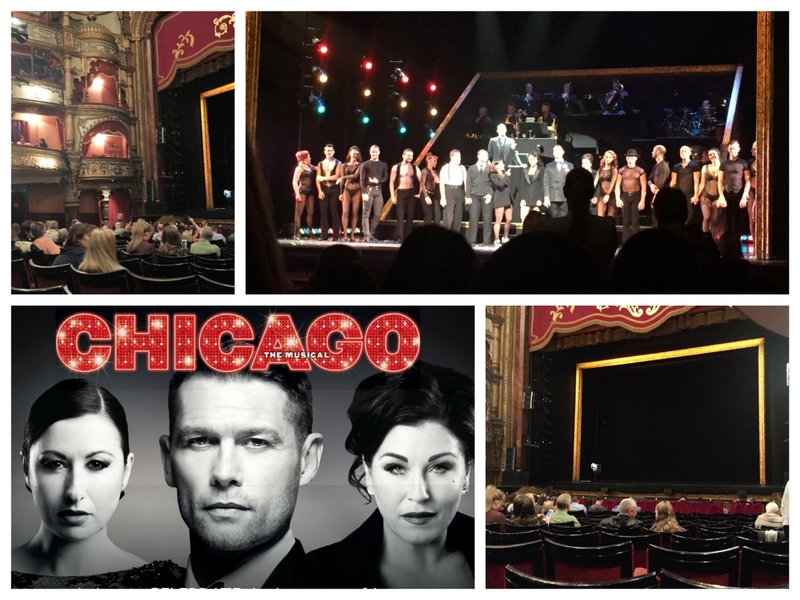 I had seen Chicago the musical several years ago when I was in London but it was Nial’s first time. As it is one of my favourite musicals I couldn’t wait for it to begin and the musical numbers to start! I mean who doesn’t love a bit of “All That Jazz” and “Razzle Dazzle”!? It’s hard to not want to break out into song yourself, tap your feet and add a few jazz hands! The cast was exceptional! Hayley Tamaddon (Emmerdale and Coronation Street) played nightclub singer Roxie Hart, Jesse Wallace (Eastenders) played matron Mama Morton, and John Partridge (Eastenders) played smooth-talking lawyer Billy Flynn. The show itself didn’t disappoint; humour, murder, and sass. At the end of the show, the whole audience gave a deafening applause and a standing ovation to the cast. The whole musical can really be summed up in the opening line “Murder, greed, corruption, exploitation, adultery and treachery…all those things we hold near and dear to our hearts”, and if you haven’t seen Chicago already I would definitely recommend it. After the buzz of the incredible show, we headed back to the hotel. We went to the bar for a short while before heading up to the room and relaxing. The rooms were lovely and quiet and we had a wonderful sleep. We woke up early and I had a lovely bath in the deep soak tub while Nial had a refreshing shower. 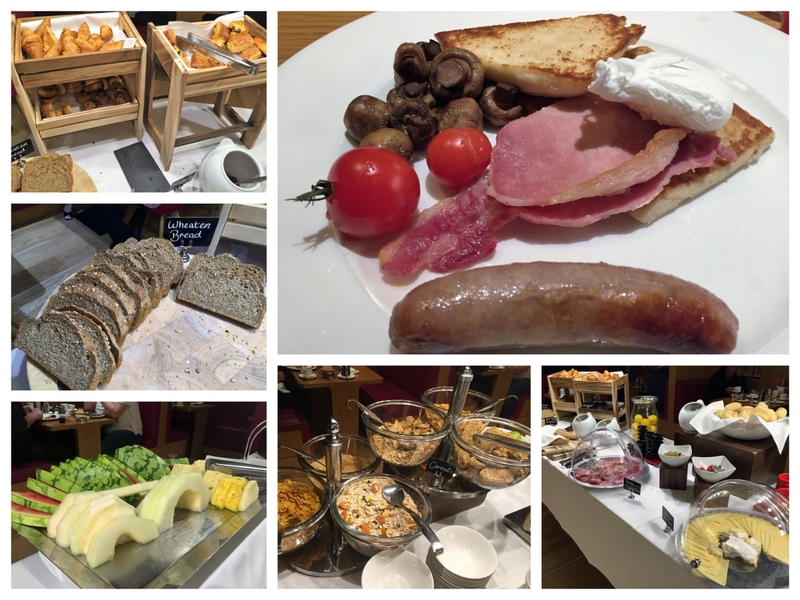 We headed down to breakfast where we were greeted with a great selection of cereals, fruit and continental meats. We both chose a cooked breakfast from the hot menu and while we waited we had some fruit, yogurt and cereal. It was a lovely breakfast to set us up for the day. 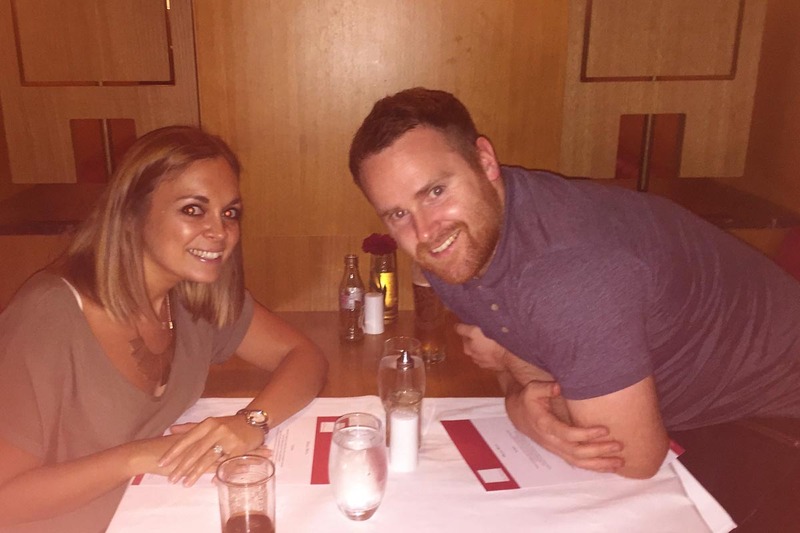 We had a fantastic stay at the Fitzwilliam Hotel and we can’t wait for another opportunity to stay again. Perhaps you also saw Chicago in the Grand Opera House? 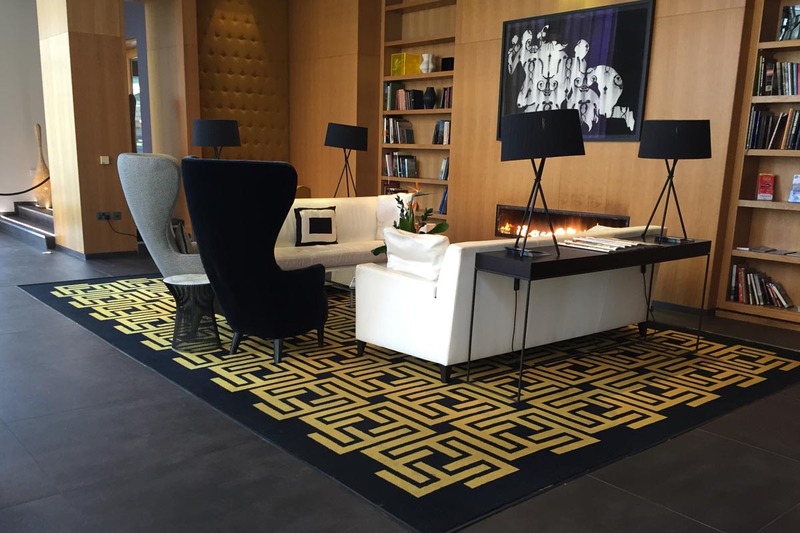 Or maybe you have stayed in the Fitzwilliam Hotel recently? Tell us about your experience by commenting below or connecting with us on Twitter, Instagram or Facebook.